You are at:HomeUncategorizedOrange Julius E-Mailed Me! You know about Orange Julius, right? 1980s: They were everywhere. I think that is why I love them so. Besides the fact that they taste like rainwater from heaven, they remind me of the days my mom, aunt, sister and cousin went shopping ALL DAY together. 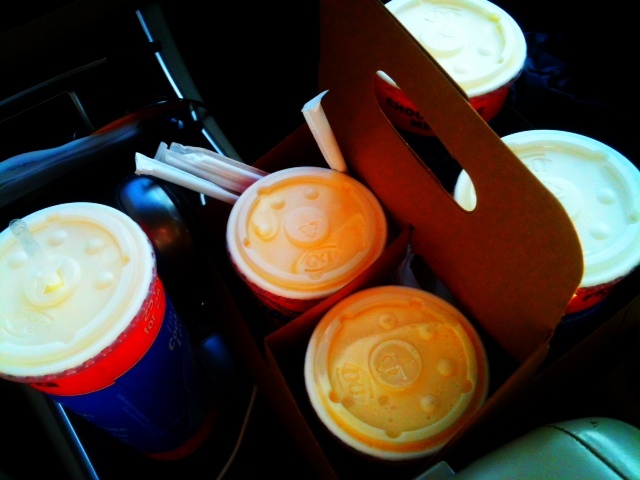 We would find time at some point for an Orange Julius. Drinking one made me feel loved and cared for, you know? If someone cared enough to buy me an Orange Julius, I could count on the fact that they wouldn’t try to sell me at a garage sale. At least not more than once. Later on: They were gone. Even later: Saw one in San Antonio and another one in Atlanta. None in Houston. More recent days: My heart ached over the memory. Even more recent: Saw one! It was about an hour away and conjoined with Dairy Queen. Ordered the largest possible size, drank it slowly and agonized over when I could come back for another one. Even more recent than my “even more recent” notch on the timeline: Went to a Dairy Queen near me, inquired about an Orange Julius, was met with a “Huh? What’s Orange Julius?”. Heart was crushed. Soon afterwards: Wrote a post about it called “I Have An Orange Julius-Shaped Hole In My Heart”. O.J. Simpson made an appearance in it even. Undisclosed span of time: Daydreamed about an Orange Julius. Tried to fill my time with other things so the memory of having an Orange Julius just within my reach wouldn’t paralyze me. Tried to make my own via the recipes on the internet and was met with disappointment at every turn. Contemplated smashing my blender to bits with a hammer. 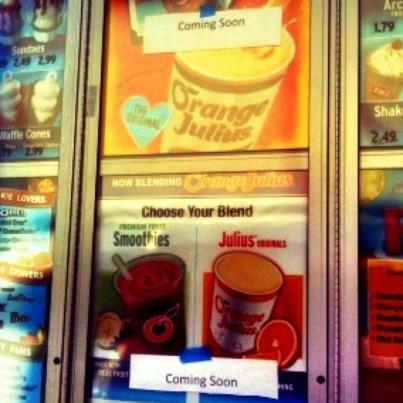 Seriously recent: My sister tells me she saw a sign that says “ORANGE JULIUS SMOOTHIES COMING SOON” and then catches me as I faint. Just after the “seriously recent” notch: Drive to that particular Dairy Queen. Ask about the arrival of the Orange Julius drinks even though this menu was staring me right in the face. They tell me I will have to wait two days. I begin to violent sob right there. People that came to the outside menu next thought it had rained in that spot only. SAME DAY: My 7-year-old asks me when he can get an Orange JULIA. He is quickly set straight. Contemplate taking away his bike for an entire year. THE VERY NEXT DAY: I GET AN E-MAIL FROM ORANGE JULIUS. I got an e-mail from Orange Julius. Someone in their company happened upon my post about my Orange Julius-shaped hole in my heart (see “Soon afterwards”) and giggled. At least a little bit. It got forwarded around a bit and then…the e-mail. Apparently, Dairy Queen will be welcoming Orange Julius drinks into their restaurants at over 4,000 locations in the next few months. HALLELUJAH! You know what I’m going to say next, don’t you? They gave me a gift card and gave me one to give away. Notice how that orange matches my blog so nicely? That would be the second time I’ve embarrassed myself at Dairy Queen over an Orange Julius. The deep pain and horrible humiliation is all worth it. Sooooo, if you want to try an Orange Julius or if you want to reunite with the blissful orange-vanilla dreamicle-y frothy drink you remember so well for free, JUST LEAVE A COMMENT.